Maggie did take me to Tynehead and dumped me in the middle of nowhere. There’s gratitude for all that washing up. I was forced to walk…. 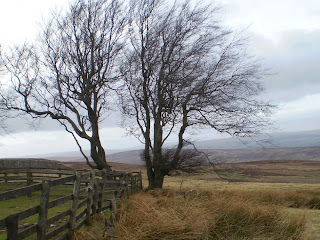 So I wandered up the road from my dumping-spot on Tynehead Fell just as far as the source of the River South Tyne. Here there is a kind of statue thingy. It has a hole in it and you’re supposed to look through the hole and see the part where the first spring of water squirts out. You can cheat and look round the side. It’s a good idea to have a little drink as the water is pure and clean and not at all what you might expect from the River Tyne. 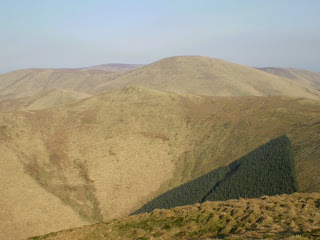 And so, I began at 20+ mile downhill walk. The section to Garrigill is, in my opinion, the very best part of this walk, with waterfalls and minerals and fine retrospective views. But we’ve done it all before in this blog…. And so, repetitively, and with the first spring lambs dozing in the warm sunshine (despute the snow on the hill and the icicles and so on…) I arrived at Garrigill. I called in at the village hall here because the local ladies were having a tea room day and were selling tea and teasted toe cakes and some rather exciting spicy soup. Meanwhile, outside, the local sproglings were amusing themselves by almost bursting in to the “café” with shouts and squeals, and then running away. I’m not sure if they were aware of just how little notice anybody was taking. 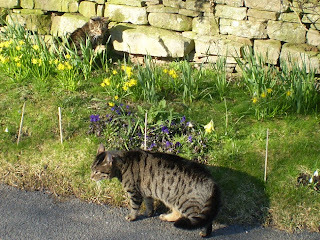 Also taking place outside was a dramatic showdown between two of Garrigill’s tom cats. They were swearing at each other and looking unconcerned at the same time – and moving ever-so-slowly….. In the morning a shepherd was doing his rounds close by and a woodpecker was pecking some wood. Nice. I lazed for a while, had me bacon and beanz and toddled off northwardsly. 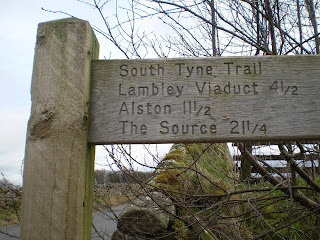 I have to say that the Northern half of the South Tyne trail itself is a bit dull, it being an ex-railway line and all that. There is the viaduct at Lambley which is impressive and possibly the reason why the line went bust, and there’s the Wallace Arms which sells all kinds of delicious real beer. Apart from that, the interest lays off-route. There’s the new lambs of course, but also there’s always the river – growing at each turn and quickly becoming a proper big river, and there’s fortified farmhouses, peles and castles (this is proper Border country which was lawless for quite a while) and lapwings , curlews, oyster catchers, snipe and all kinds of small and occasionally colourful small birds. Then, with a final viaduct over the Tyne at Haltwhistle, its all over. Tea and more soup at the Pillar Box café (has a pillar box outside) then the train back to Durham and bus to sunny Crook. 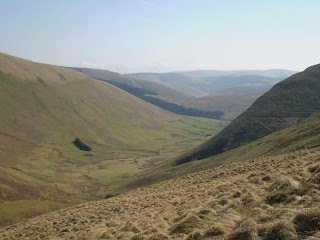 I have my eye on a nice little camping spot just off the Pennine Way too..
And its nice and sunny! 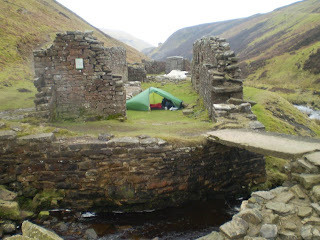 Pic is a camp in S Tynedale on my Pennine Way jaunt a couple of years ago. Superdawg had the idea of heading up Teesdale for some leg-cocking in the juniper woodland around High Force, and also to have a look at the waterfall which should be in spate(ish) due to the recent batch of lambing showers we’ve been having. And so, armed with the now traditional cheese butty and banana, we parked the knipemobile at Bowlees and crossed Tees by the wobbly bridge (aka Winch Bridge) and headed off up the Pennine Way towards High Force. Deep in the juniper scrub, just inside the Natural Trust reserve, we came across a small group of Countryside Volunteers doing some (presumably voluntary) work on the NT’s “Dirty Hands” campaign to encourage volunteering in the countryside - aka the “Get Dirty for the Natural Trust” campaign. They were bagging up a batch of juniper seedlings, apparently for sale to a garden centre in Haltwhistle. I was a bit surprised by this, specially since this juniper woodland, just like everything else nowadays is supposed to be “Under Threat” but, as one of them explained, they had to generate some income for “Green Projects” such as the new road and visitor car park for Black Sail Hut and the wind generators for Malham Tarn House. So, I expect that’s OK, then. It kind of explains how B&Q in Bishop Auckland were selling Spring Gentians for £1.99 each last May too, I suppose. Of them, who’s ID badge introduced as “Maggie”, a skinny, bespectacled hippy-type with beads, spied my digital camera and said words to the effect that she hoped I wasn’t going to snap any pictures of the waterfall. I told her that I was fully aware of the Natural Trust’s “ban” on photography at High Force and I promised not to take any pics without the proper permit. (They’re £12 for a day ticket at the High Force Hotel, apparently) I did sneak the snap shown above – don’t tell anybody! I thought it was all a bit officious and left me feeling just a tad annoyed. They’ve also gone a bit overboard with the “No Photography” signs, which are all the way up the Pennine Way from Winch Bridge to Cauldron Snout. I’m wasn’t entirely sure how they police this till I noticed a security camera attached to an old ash tree – and, laughably, very badly disguised as a nesting box! It was the little antennae and the whirring noise as I passed that did it. How they manage to get delicate little things like Maggie to carry out the threat to confiscate the cameras of miscreants is a mystery, although I did notice a cardboard box with a couple of cameras in it at High Force. I wondered how legal this could be….. I though there was a slight whiff of something “herbal” about her anyway and the thought crossed my mind that maybe they were selling the cameras to pay for their habits. But no, I shouldn't be suspicious. volunteers do a great job, specially in Conservation. Visited Durham railway station today and picked up my TGO train tickets to Edinburgh and my tickets to Sanquhar and back in a couple of weeks time. 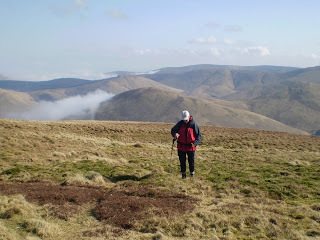 The Sanquhar trip will be four days of backpacking and wild camping which is part of my TGO challenge training and trying-things-out event that I do every April prior to a Challenge. This year, I'm trying to get everything into a new 45 ltr rucksack. I've also been quite confused about cooking stuff - that is things to cook and eat out of, not things to cook. I bought a Primus ETA stove and panset with an extra, slightly smaller pan. This boils water at an incredible rate, but I've decided its too heavy. So today, I got a little cheapo Blacks non-stick panset into which will fit my old Primus stove (not sure what the model is, but its very small...) and a selection of instant MOD tea, coffee and sugar bags - enough for a week's brew-ups, infact. This is half the weight of the other thing. Incidentally, the other thing started backfiring. Did it get too hot, without any wind? Or is it a fault? Is it, in fact, a problem at all? Would it be a problem with the canister? And what did I do with the receipt? Anyway, my planning at the moment is centred around the Sanquhar trip and a possible crack at the South Tyne trail in a few days time. Meanwhile, back at the TGO Challenge training plan (I expect you’re getting bored by TGO stuff by now…. ) – It seems that in March, I should orta do a longer walk than whatever was the longest walk I managed in February. 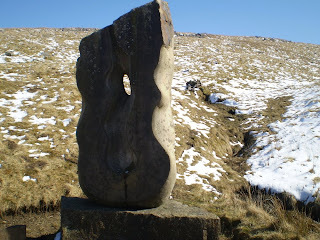 And so, I consulted my diary of walks and found that last march I walked from Wolsingham to Hamsterley Forest via Doctor’s gate and then up Sharnberry Gill nad back over the moors by Five Pikes and the Elephant Trees. I consulted the dawg and it was agreed that as neither of us could think of a better one at such short notice – this is what we would do. It’s a steep start, up the road towards Hamsterley and then turning off on a even minorrer road passing St Johns Hall to Doctors gate. 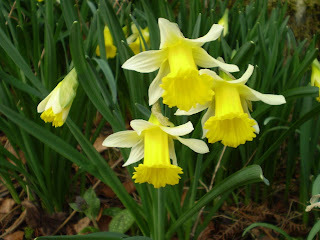 The Daffies were flowering at St Johns Hall. This may, at first glance, seem a trivial point but no ! I said No! Y’see your St Johns Hall once belonmged to the Backhouse family. These peeps were rich magnates. This means that bits of metal adhered to them. The bits of metal in question in this case being money. They had lots of it and they founded banks with it and lent money to other Victorians to build things with – like railways and bridges and mines and factories. One William Backhouse spent some time at St Johns Hall breeding daffodils. Hence the daffies were out at St Johns Hall. I don’t think these were special ones, though. Somebody would have pinched special ones. 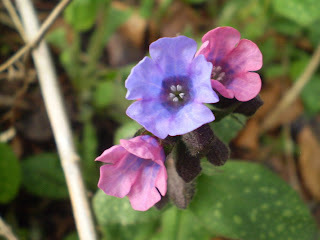 There was also a very pretty patch of what appears to be Lungwort – according to my Wild Flower key which cost me twenty quid, so it must be right. I only mention these things because it’s obviously spring. Incidentally, speaking of banks, I’ve just realised that HBOS went nips up almost immediately after I’d finished paying my mortgage. Food for thought, there. I’m sure you will agree. Anyway, we plodded on over (or is it through?) Doctor’s gate – so called because that’s the way the doctor came (I think) – and over the flat moor and down into Hamsterley Forest. This forest is remarkably similar to Fetterresso Forest which is why its good for training. Similar in the way its full of trees. 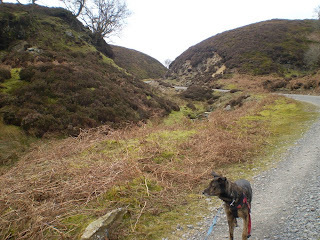 I lunched briefly whilst Bruno destroyed some sticks (lots of sticks in H. Forest) – and then up onto the moors via Sharnberry Gill. Sharnberry is a very young feature, geologically – being only 12 to 13000 years old. Which is young. It is, in fact, the overflow from a very deep and large lake caused by the bunging up of Teesdale with an enormous wall of ice. 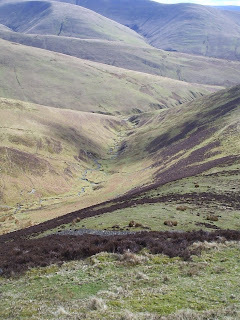 Thus it was global warming that caused enormous torrents of water to gouge out this gully over the watershed. Victorian leadminers did a bit more damage. 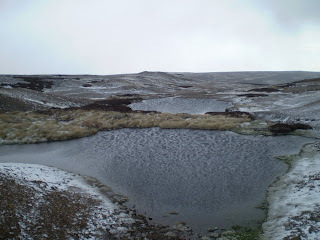 Global cooling over the last 7000 years has caused it to fill in a bit with sphagnum and peat and other sloppy things. 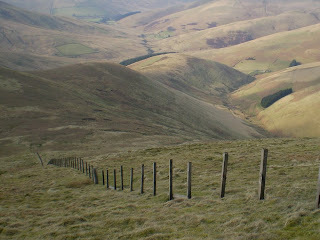 I always get the next bit of moor between the road and an estate track near Pawlaw Pike wrong. I just can’t find the path. Its easier if you go the other way. The sign says dogs are banned from this bit of open access. This doesn’t apply on public footpaths, which is what we’re trying to follow. But if they want me and superdawg to follow the path accurately, they should put some waymarker poles in. Otherwise we just trespass. Take me to court, I don’t care. 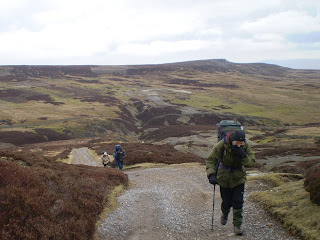 After this, its downhill for lots and lots of miles on good paths, tracks and roads. Its a romp. We pass the elephant trees. 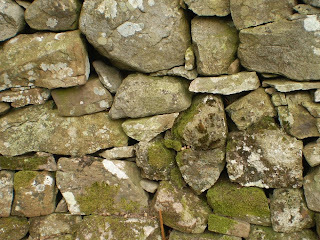 (see a previous posting) and a chap mending the stone wall. We finish. We go home. We (That is I) drink tea. We fall asleep. We have walked 18 and a bit miles and climbed 2300 feet. And finally it was Thursday. 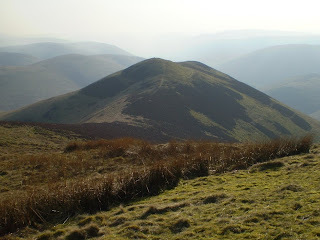 This walk bags three Marylins around the Mosspaul Hotel -Wisp Hill Pikethaw Hill and Ellson Fell. After a perishing cold night (where’s me new sleeping bag? 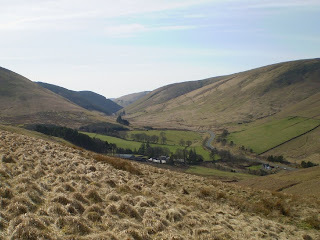 ), we pitched up near the Mosspaul Hotel just on the Dumfries/Borders boundary and stomped off up the enormous 350 metre climb on to the top of Wisp Hill. At 595 metres, this was the sudden summit of today’s walk, for the next top – just a little bit South (ish) was the 564 metre top of Pikethaw Hill. 600 metres of up in just 4 km so far. This is thigh-bustin stuff. 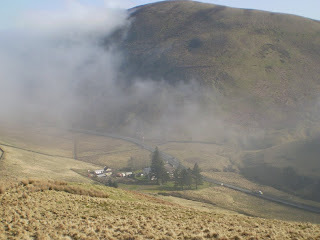 But not to be deterred by mere muscle pain – we tripped lightly over Frodaw Height and Dan’s Hags for the knee-bustingly steep 200 metre drop from Upper Hill to the old toll house in the valley bottom. Roughly at this point, Mike discovered an easier way back to Mosspaul and declared his intention to follow it. Me, being equally as determined as stupid, plumped for the return over Ellson Fell and Carlin Tooth – a further calf-numbing climb of about another 400 metres – making (in English) a total of nine miles and 3600 feet of climbing. Many will consider this to be a weak effort, I have no doubt. Actually, it wasn’t too bad really. It’s a cracking walk with big views and we had a fab and sunny day for it. This is just like the Lake District, but without the people. And then it was Wednesday. 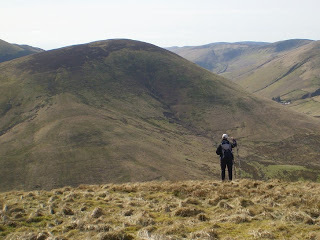 Today’s objectives were Arkleton Hill and Pike Fell, both hills rising on the West side of Tarras Water. Tarras Water is just a little bit North of Langholm and is a reserve noted for the preservation of Hen Harriers, of which we saw none at all. We parked initially by Tarass Lodge and reparked shortly afterwards in a little car park just up the dale. A sign would have prevented such faffing about – but nevertheless we marched off in an optimistic and cheerful mood up the valley of the water of Tarras. This is a very beautiful valley and you should have a look some time. 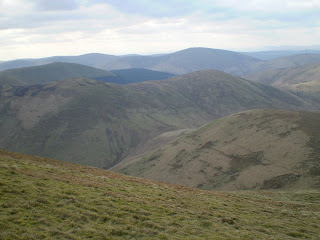 A few miles up this glen, we turned ff to climb the steep and tussocky Arkleton Hill. Nobody knows where the summit of this hill is.. The top is flattish and heatheryish and generally a bit bumpy. Frankly, the top could be anywhere and in the mist and cold that was Wednesday, we settled for the first bump we came across. The sun just about came out at the far end of Arkleton – up to this it had been cold and windy and misty. A very steep descent took us to the bottom of Pike Fell. The top of this is obviously the top, so no worries there. 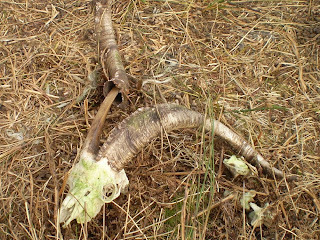 What was just a little worrying was the feral goat we came across with a very newborn kid. This poor mum was in a clear panic at our approach and was torn between running away and seeing to her baby which was stumbling about pathetically trying to follow. We gave them a bit of space by as wide a diversion as was possible. I watched them join a small group of goats making their way across the moor. There were other goats with kids later in the walk. 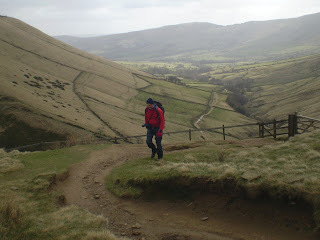 We descended to the valley and followed it back to the start. 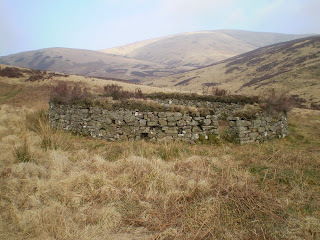 Some of the pics are of a sheepfold in the Tarras Glen and it’s dead billy goat occupant. The goats here seem to be mainly black and white coloured. They’re a week or two ahead of the local sheep in terms of producing young. Presumably, they know what they’re doing here, but it seems a risky business since it always turns cold and snows when the first lambs come along. Maybe they’re just very tough. This is a wild and remote little dale with just a few houses. There were what appeared to be scientists with science stuff doing science things. And their pet dogs which were enthusiastically friendly. A short visit to the Langholm co-op and off-licence proved a waste of time as we both turned to kip early without drinking our beers….. This was about 11 miles and 1700 feet of climbing, so a bit of a relief from the previous day.I can’t understand why this fab area is so quiet from the walkers….. 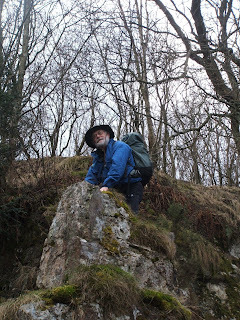 I arranged to meet Mike, the go4awalk bloke wots appeared in previous blog posts at the Duke of Buccleuch’s little car park somewhere off the A7 about 5 miles South of Hawick (pro Hoyk by the way). 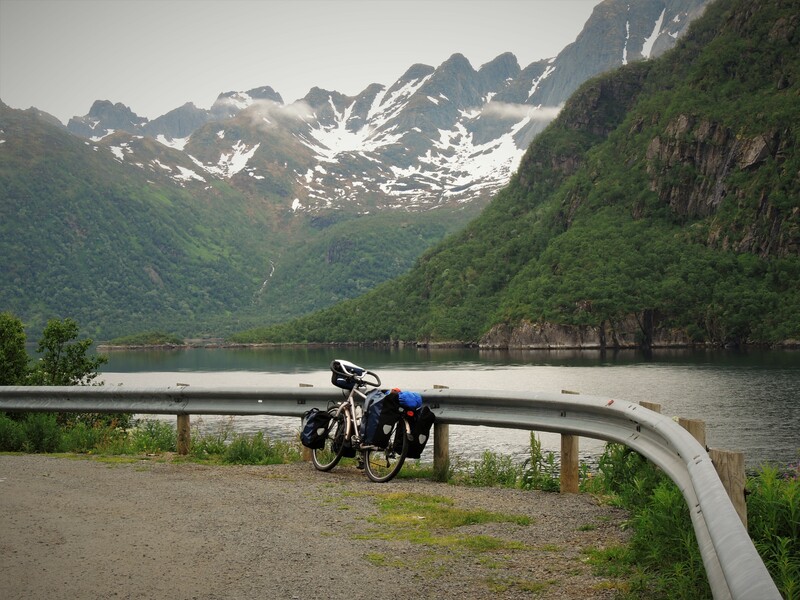 This is a very quite place for a camper van and an akto and provided a nice little base for three days of walking. 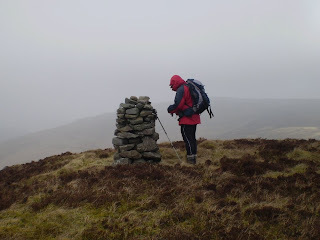 Walk number one – on Tuesday 17 March, in a little mist and a little sun, was from Linhope on the A7 and took in Lightening Hill (no place to be in a thunder storm), , Wether Law(wether = a category of sheep), Millstone Edge (no obvious millstones), Tudhope Hill – the highest point at 599 metres, Carlin Tooth (a carlin being a hare, or /and a witch or an old lady) , Bye Hill (no idea) and Dod Hill (Dods are normally round hills and Dod Hill is very round) - a total of just about seven and a bit miles but with the magnificent amount of uphill walking of 2700 feet. Needless to say, that this is a walk of quite a lot of uphill work, and an equivalent amount of steep downhill stuff as well. This is just real A1 industrial strength, unsurpassed, all-round good-egg fell walking – easyish most of the time with big views and some surprisingly steep and pointed tops nearby. With throbbing thighs, we repaired to Skelfhill to drink all of Mike’s beer. A cold, still and condensation drippy night followed and lead to a foggy cold dawn. 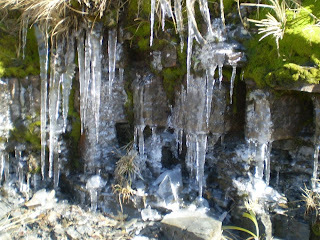 Brrrr….. see the next post…. Gawd I hope it gets warmer….. Put the tent up, alongside a few others in the ever-so-slightly-tilted grassy bits around Snake Inn’s car park, had a beer, had another beer, had some more beer, then made a cup of tea on my NEW STOVE. Boils very quick and doesn’t scorch the grass. Friday night at the Snake Inn was purely for a spot of lightweight convivial boozing. Saturday dawned clear and windy and a large bunch (or is it a bunch of large) Challengers hurtled off to Edale in some laid-on transport and , after some initial hesitation where nobody could decide whether or not there was a walk leader, we sort of started drifting off towards Scotland, up the Pennine Way. It were windy. At a rest stop Sue Banfield produced a box of caramel shortcake and we all got cold. 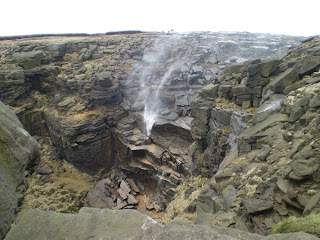 Later, Kinder Downfall was blowing backwards, as it does sometimes and nobody could find the Kinder Eggs. There were suspicions that whoever said that this was the origin of the famous kiddie’s sweety may have been telling porkies for their own nefarious enjoyment. Personally, I’m not so sure. 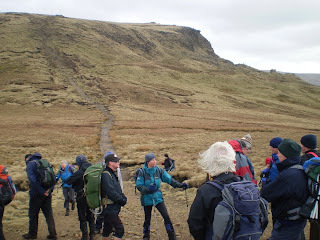 The party split at the North end of the plateau and some went off down the direct path whilst others (including me) padded along the flags for a bit more Pennine Way, cut down Doctors Gate and finished with a flourish in some woods. The Snake Inn is a fine choice for a grand gnoshup and a fine dinner was had. Various well-know challengers and bloggers and challenger/bloggers were there (as you’ve probably already worked out) and it was nice to meet Sue and Martin Banfield of Postcard from Timperley fame, and Phil (Lord Elpus) and Tina (Miss Whiplash) Lambert who do yer Doodlecat and Alvar and Anne who you may remember we met in the snowy Lake District a few weeks ago. Rather nice to meet Miss Whiplash in the flesh, as it happens and she did assure me that the wheals and rope marks will wear off with time. The hot poker burns may take longer. Anyway, it were a cracking do. Most, or at least some of the usual suspects were there and there was a fair smattering of Challenge virgins, and one or two people who had never done it before either. 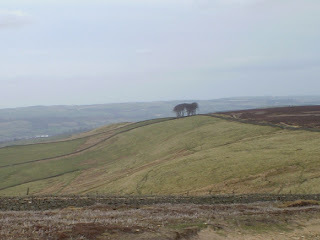 Sunday saw me doing a little round around Black Edge and Comb Moss somewhere quite near to Chapel en le Frith. 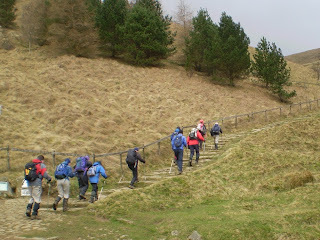 It’s a cracking walk to go around this edge – everywhere steep and rocky below, but magnificently level walking. Go off the path at your peril, though as the dangerously tough tussocks tend to trap the off-route tourist. I bet you can’t read that last bit with a gobful of toast, innit? Finished with a flourish by driving up the M1. See who you can identify in the photo. The prize is a night out with all of them at the Park Hotel in Montrose. Make your own way there and you'll have to buy the beer. A few other bloggers and forum posters have been blogging and posting about train tickets for the post-TGO challenge aftermath journey home, I have, in fact, been offerred a lift from Montrose to Crook, albeit via Shiel Bridge and I was going to leave it at that. However, I decided just now that I might be wise to buy a train ticket because, like budgies in a cage, they're apparently going cheap just now. And its quicker by train, and what if the other chap fails to arrive in Montrose or gets knocked down by a fish wagon on the A9, or abducted by Aileens, or something....? It was £23 from Montrose to Durham. The full fare seems to be in three figures. I can collect the ticket from Montrose station, which avoids losing them somewhere in the heelands or getting them soggy in a bog. 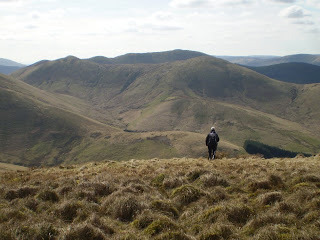 In the meantime, I've a few busy walking days lined up - The TGO Challenge English gathering at the Snake Inn from tommorrow till Sunday - probably two walks - and a few days in the Borders, somewhere quite close to the A7 from Tuesday. Just got a Primus ETA stove. As this had a frying pan/lid, it fulfils bacon frying criteria. It boils water very fast too. So, I'm chuffed with this. I also bought a Craster kipper in Durham and some fish pie mix which has salmon and cod and coley and big grey goggle-eyed sea monster from the deep wottle eat your legs as you paddle in the shallows and spit out your toenails at people's windows late at night . I'm torn between making a fish pie or I could tie it into a mesh bag and walk around the streets of Crook capturing cats. Fish pie, probably. And I got a rucksack. its a red one, weighs 2.2 kg and has a built-in rain cover that when you get it out, it stops raining. 55 litres. Its a Deuter something or other. I would have got one of them osprey thingies but there were none in the town big enough for backpacking. And I wanted one now. Anyway, thats http://www.backpackinglight.co.uk/ for all your backpacking needs. And a bag of skittles. I expect many of you already knew that, though. Just for feedback - I bought a 1.7 litre Primus ETA pan from backpackinglight. Ta for those people who recommended that one. Oddly, though, the price of these things goes down the bigger they get. So, I thinks to myself- wot holds a lot, will hold a little, and, me being a bit of a pig where troughing is concerned , I thought, why not get a biggun? 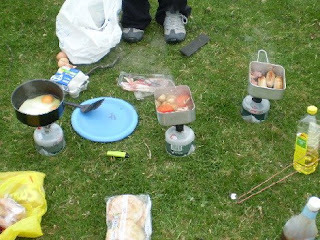 (My dinner up Swaledale for instance was a microwave fried rice (you can cook these in a pan) -serves two, and a Stag . Why do they call it "Stag"? - Sweet and Sour Chicken - also serves two. Thats four. No wonder I couldn't move for 14 hours. This is also why I was confifdent about not being blown away in the energetic breezes coming over the Pennines and rattling me flysheet. Too heavy, see? 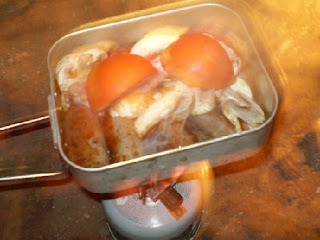 Pic of a breakfast in an army mess tin. Due to a minor misunderstanding, me and the brother parked in separate car parks, about 200 metres apart in Whinlatter pass. Eventually, I went on patrol and found him. 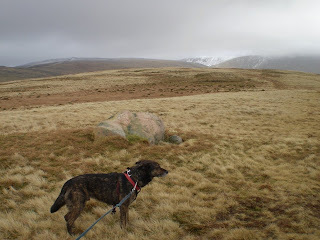 We decided that the fells looked, frankly, orrible with lots of wet snow and hill fog and that driving hailstone stuff, that we’d go for the Plan B. Plan B was to abandon a car at Whinlatter and go to the little back road from near Ennerdale to Gosforth and go off and bag Birketts. Yes, Birkett baggers, eat my dust. Or , rather, slurp my slutch. 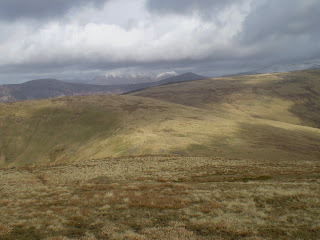 We bagged another five of the little beggars – Blakely raise, Kinniside, Latter Barrow, Swarth fell and Burn Edge, plus repeat ascents of Whoap and Lank Rigg. I think Whoap ought to have an exclamation mark, actually. This would be good for hillwalkers pub quizzes. It sounds like when your feet suddenly go out of control on wet grass. Whoap! Followed by an invitation to play rudies e.g. Whoap! F**k me! Anyway, it was a short walk, all over far too quickly, for these are nice, grassy, friendly fells with a lovely view of the High Stile ridge and a nuclear power station. Bruno liked it too. I went over me boots in Whoap (!) Beck, followed by the traditional Whoap! Exclamation (see above). Luckily, nobody was listening as I was in no fit state for that sort of thing anyway as I hadn't yet scoffed my banana. Anyway, another five Birketts – that’s 22. so far this year (444 in absolute total). I suspect there may not be many more this year. In Iceland, do they have Bjorketts, I wonder? Or is it just frozen chips? The man from the garage said that there was a hairline crack in the thingy, and that this made the other thingy think that it was driving on ice and therefore, applying the abs thingy whenever I put my foot on the brake and if I was to give him £65 he would stop it doing it for me. So I did. 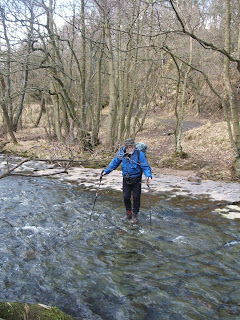 And there was then nothing stopping me…er actually, I should rephrase that – I was free to join the backpackers club jamboree and group shivering event at Arkengarthdale, so off I went wiv me new brakes. It was dark when I got there, so putting up the akto was its usual putting up a tent in the dark challenge, and I seem to have been introduced to one or two very dark-looking people with lights on their heads. So I went to the Red Lion and, it would seem, most of them followed me. The takings of the Red Lion soared. I met various people who’s names I will resolutely fail to remember, cos I’m useless at that sort of thing, and I seem to have already been acquainted with one or two others. There were TGO Challengers in the pub, so we could talk about Glen Feshie and stuff like that. After, apparently, sleeping in my tent for about 9 hours, I got up and went for a walk. Anyway, I climbed Calver Hill, which has a cairn and some grass, much like many other hills I’m sure you will find. 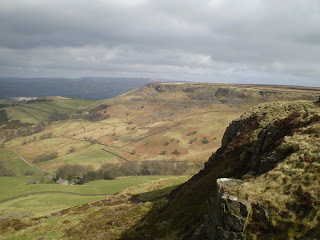 It also has a fairly good view of Swaledale. It was perishing cold and windy, though, so I didnlt hang about. 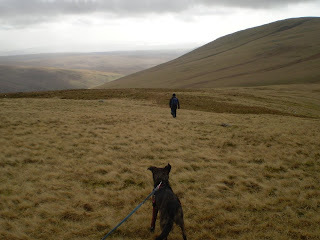 Instead of hanging about, I went off towards Gunnerside Gill and met another Backpacking Club chappie with his little dog, and, later, three other backpacking club chappies without dogs who were heading for the upper reaches of Gunnerside Gill, and who did the mild berating and invited me along. But, I’d decided where I was going to camp and I sort of thought it might be fairly sheltered out of the increasingly lively wind coming from the general direction of dahn sarf. 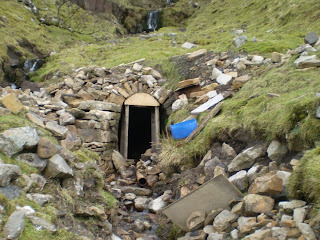 It did occur to me that as Gunnerside Gill runs North-South, it might actually funnel this wind through my scanties during the night, but I gave the thought notice, informed it of it’s right of appeal within three weeks of receiving my letter and dismissed it forthwith, sending a colleague along to supervise the clearing of it’s desk. 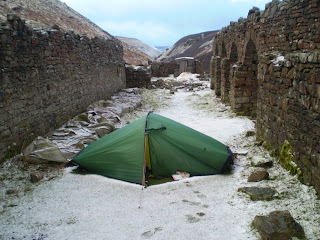 I put the tent up within the walls of an old (an ex-) peat-drying store and settled in for a bit of a snooze. I was awakened very shortly by the flapping. This flapping got more and more flappy over the next couple of hours and, eventually became, what can only be described as “frantic”. This continued all night. I weighted the tent pegs with big rocks and cooked my tea and drank my whisky and dozed fitfully. Every now and then the frantic flapping increased its franticness to levels which would have it locked up under the Mental Health Act. Psychotic. Unreasonable. Windy. Sometime around dawn, it all stopped. Quite suddenly. I formed the opinion that it had either tired itself out and was now sleeping peaceful-like in it’s cot with a dummy in, or that the wind had changed. The very next interesting thing was a sort of zipping/swishing noise. This happened several times. I looked out to investigate and found that it must have been the snow sliding off the slick fabric of the akto. Reeth for soup and tea, then home. But what of the Backpackers Club? Well, they’re very friendly and welcoming and may have been a bit miffed that I went off on my own. I’m not sure. Anyway, maybe next time I’ll join a small gaggle. The ones I met were walking at roughly my own pace. I might follow them next time. Possibly more walkies tomorrow. I have a sandwhich and a Plan A and a Plan B. **Do we all know what a hush is? Shall I explain? Or not? Hmmmmm? I seem to be having trouble doing what I'm supposed to be doing just now. What I'm supposed to be doing is either lolling around snoozing on the sofa or marching manfully and dogfully over the fells. After the great response to my plea for advice on stoves and sacks and sleeping bags, yesterday, I decided that a trip to Durham would be in order. Unfortunately my car was desperately ill in the garage and just sat there mournfully pleading with me to save myself and go on without it. Obviously, I couln't leave it there , so I bought it a new battery. After some fiddling with spanners and a bit of ripping away at some rusty things, I got the new one in and set off, only to be faced with a horrible noise coming from the front brakes. Its booked in to the car hospital tommorrow for an emergency operation. In the meantime, I'm supposed to be. 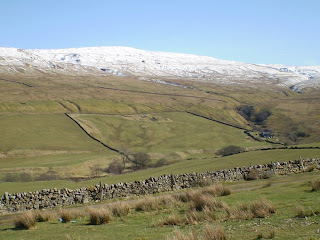 going to Arkengarthdale for a backpackers club weekend. In the other meantime, various landlording business things have got me hanging around today for a gas fitter and an electrician, and I have to do stuff at the estate agents. The plans are gannin aglae. I'm not supposed to have a job. I'm supposed to be larking about. In the yet another meantime - big thanks to everybody who offerred advice - it was all good - to such an extent that I'm now feeling a bit confused by all of the options. I have to make some decisions now. I've decided to go to Keswick when the car's fixed and wander around feeling up sleeping bags and talking about stoves to young lads with spots. But first, I need to really analyse what peeps have said. Here's a cuppla more pictures from Brian's camera, taken on our Frosterley radging session the other day. In the meantime, me and my brother have just finally finalised in a final sort of way, my Mum's estate. Well, kindof anyway. The result is that I have a small amount of ready cash to dispose on items of backpacking equipment and as many if not some of my audience are experienced backpackers and all-round gear sluts, I wouldn;t mind some opinions on what I should buy. 3) Something to put it all in and carry it about. Light, robust and masculine. 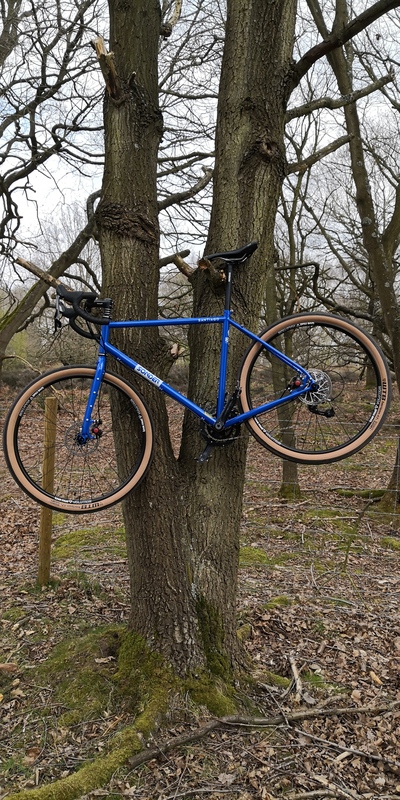 A bit like me, apart from the lightness and the robustness. And the masculine.. ahem, anyway. Send you advice here. No money will be paid. What, oh what, shall I do, I'm in a tizzie. 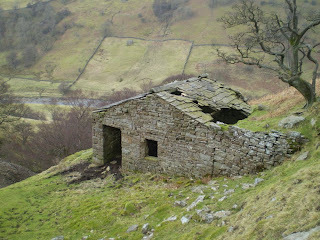 I didn’t nearly went to Swaledale today, I did went to Swaledale. We parked at the city centre car park at Muker (£3.50!!!) and wandered off to find a track which leads up to a little stone hut I’d noticed from a distance whilst walking on Kisdon a few months ago. (Incidentally, for non-dialect speakers, Muker is pronounced Myookah. It translates roughly as the shieling of the dirty cows wot’ll give you a good time anyway for the price of a pint of brandy. But that’s dialect for you. Anyway, I located the start of the path fairly easily – turned out to be a pleasant grassy rake leading up through scrubby woodland of ash and hawthorn and birch and all of those natural trees of Northern woodland. This must be a fab place in high summer and I must return to it. 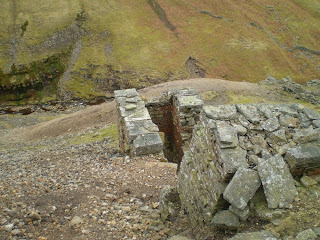 Eventually, I reached the little hut, which turned out to be a bit bigger than I expected, though ruinous and with well over a hundred years of sheepshit inside. Its purpose seemed obvious. It was a mine shop. 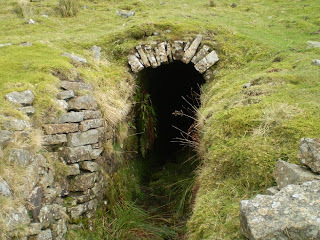 This isn’t a place to buy mines or mine souveneirs, but the place where the miners lived during the week. And to prove it, there in the beck bottom, was a mine level. Some work was being carried out in restoring the arched entrance way. Two blokes turned up just then and one explained some of the history of the place, most of which I failed to remember. But the gist of it was that it was opened in the mid eighteenth century, then closed in the early nineteenth and reopened for a mere three years in the mid nineteenth. So it had lain festering and falling apart for about 150 years. 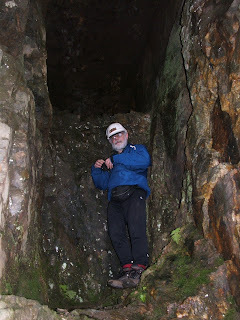 We climbed up the gill – and shortly discovered a second entrance. I wondered whether or not the lower one was, in fact the wet level, to drain out the water, and this was the working level. A short distance uphill, behind a couple of boulders, lay the third, highest level. When the word “bugger” was shouted inside, it reverberated with distance. It’s a deep hole. I must go in it. Innit? I’ve emailed my hole-exploring pal about it. 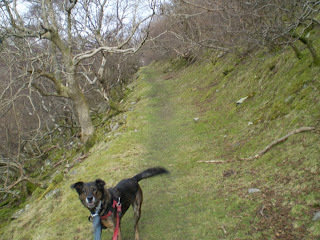 Me and the dawg followed the path along the hillside over West Arn Gill and into Swinner Gill. This is as fab a bit of fellwalking as you could wish for. Its complicated with bits of “in”, and other bits of “out” – of gullies and scree fields, and the views of Swaledale are smashing and unusual. 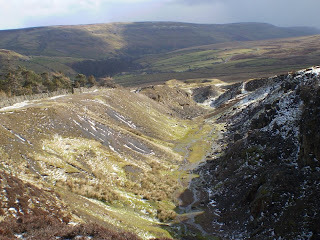 We traversed the moor over to Gunnerside Gill and , in the spirit of the walk, I explored the steep Western side near Botcher Gill - and discovered a wheel pit and rediscovered scree running down it’s 50 metres of spoil heap. Very steep. Very good fun. But then I saw the weather forecast… I may postpone for a day or so. The bananas will be OK I may have to eat the roast pork. We did ten and a half miles by the way. Boots were fine.